This afternoon, HP announced the Slate 21 all-in-one desktop computer. This isn’t some usual desktop PC though. What makes the Slate 21 unique is that it is powered by NVIDIA’s Tegra 4 processor, as well as featuring Android 4.2.2 as its operating system. Based on Google’s app services, users have access to all of Android’s apps, as well as a few specially designed apps from HP that make it more of a “computer” in that sense. The HP Slate21 All-in-One expands upon HP’s portfolio of multi-OS products and is ideal for family activities, providing easy access to entertainment and productivity features, plus fun Android apps. Through Google Services, customers can reach shared content such as calendars, email, notes and documents, which can be created with the built-in productivity apps; users can also print wirelessly from anywhere in the house, organize content, and connect to other devices. The Slate 21 will go on sale starting in September for just $399, which is sort of intriguing, sporting a 21.5″ Full HD touchscreen display, DTS sound, multi-user support (thanks to Android), and a built-in HP webcam. Plus, as shown in that picture, it has full keyboard and mouse support. Thoughts on a Android-powered desktop computer? PALO ALTO, Calif., June 24, 2013 – HP today unveiled the HP Slate21 All-in-One, the company’s first All-in-One PC built with the AndroidTM 4.2 operating system. The HP Slate21 All-in-One enables families to enjoy cloud-based entertainment features such as TV streaming and Android apps. To further enhance productivity and entertainment, the Slate21 All-in-One offers a 21.5-inch Full HD (2) diagonal reclining IPS touchscreen with wide-viewing angles for vivid graphics and better shared viewing. With dual-band technology, users can stream music or movies and browse the web (3) at the same time, and built-in DTS Sound technology offers a rich concert-like experience. It comes pre-installed with an HP TrueVision HD Webcam and Wireless Direct (4) which enables users to share videos, photos and data between devices without the need for a network connection, and multi-user support with the latest Android OS Jelly Bean 4.2. Additionally, it offers speed and performance with a powerful Tegra 4 quad-core NVIDIA processor, as well as an intuitive optical touchscreen with true pinch and zoom functionality. 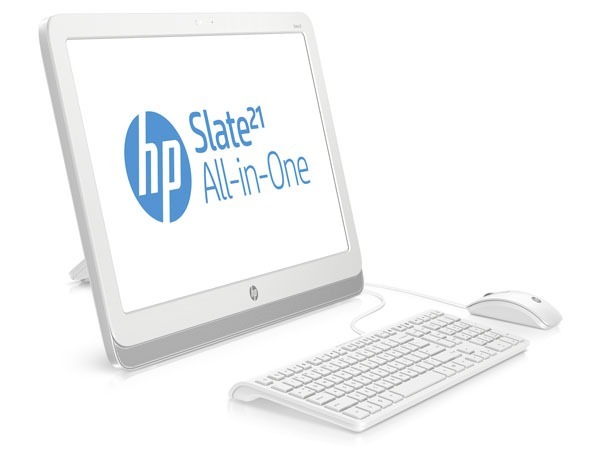 The HP Slate21 All-in-One is expected to be available in the U.S. in September, with a starting price of $399 (5) Additional information about the HP Slate21 All-in-One is available on The Next Bench.